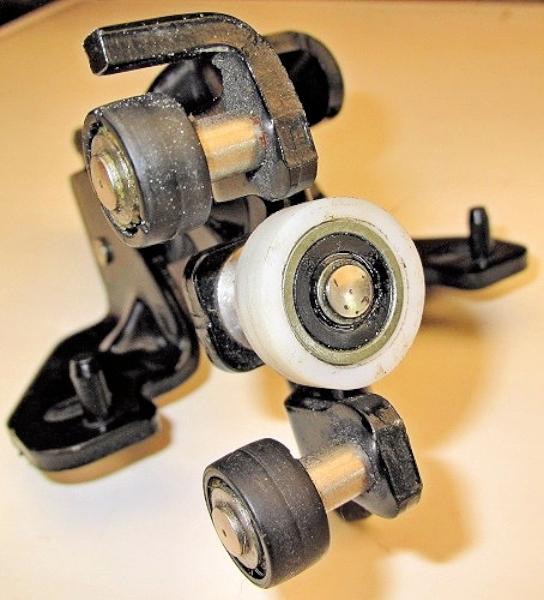 If one of the tyres on the ROLLERS becomes worn or split then bear in mind that the load is taken mostly by the centre ROLLERS and the lower ROLLERS. 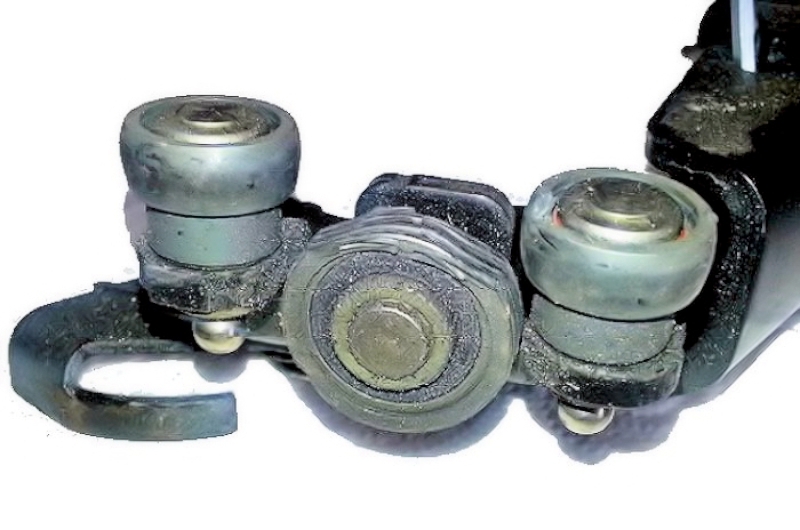 Check by fully opening the door and watch the ROLLERS rotate as the door starts to close. 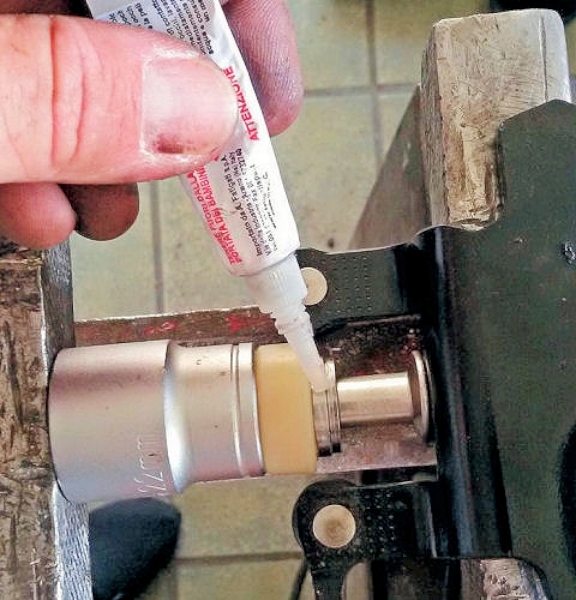 Always clean the GUIDE RAILS - do NOT oil/grease them. Should the paint get wrinkly or worn; using a flat file and emery paper, gently rub down the lower running surfaces until they are smooth. Up to you if you repaint them; I don't myself. 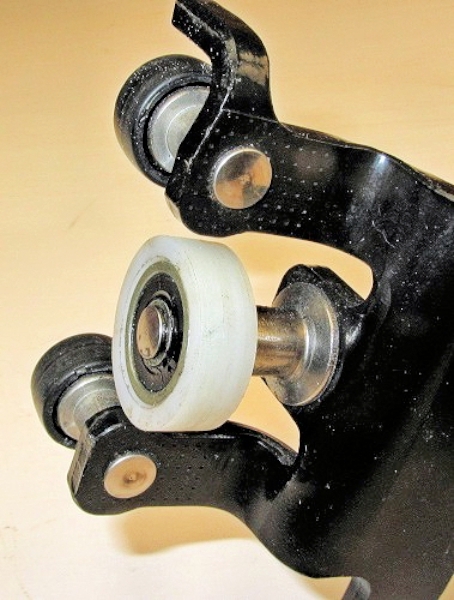 Most problems seem to be with the centre ROLLERS. I've not heard of many problems with the lower ROLLERS - but with the door open you might grovel on the floor and look upwards to see if the lower GUIDE RAIL is clean and clear of obstructions. Unless you have too many, be careful with fingers at all times and make sure you have both remote key fobs in your care so no-one else can "help" by moving the doors whilst your fingers are in there. This is the hinge assembly that runs on the centre (middle) GUIDE RAIL; the larger ROLLER takes more than half of the load of the heavy door. The lower hinge assembly transmits the movement of the open/close motor-driven cables to the door. The upper guide locates the top of the door. 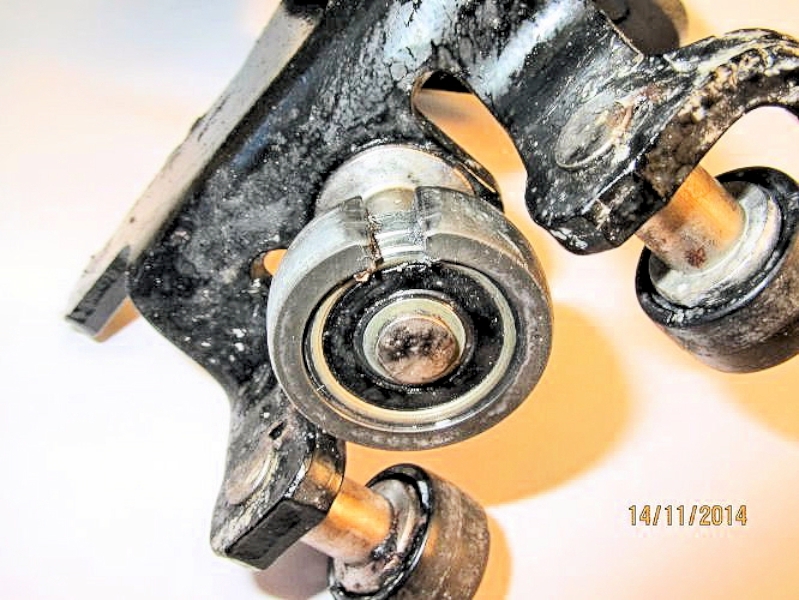 I oiled the ROLLER axles on one car and the vital large ROLLER and the paint on the GUIDE RAIL running surfaces failed on both sides about two years later. Possibly some oil did stray onto the roller and guide surfaces though I thought I had cleaned them off. The other two cars I haven't oiled and they go on-and-on and the one shown has 91,000 plus miles. So the recommendation has to be - Do not oil the ROLLERS or the GUIDE RAILS. 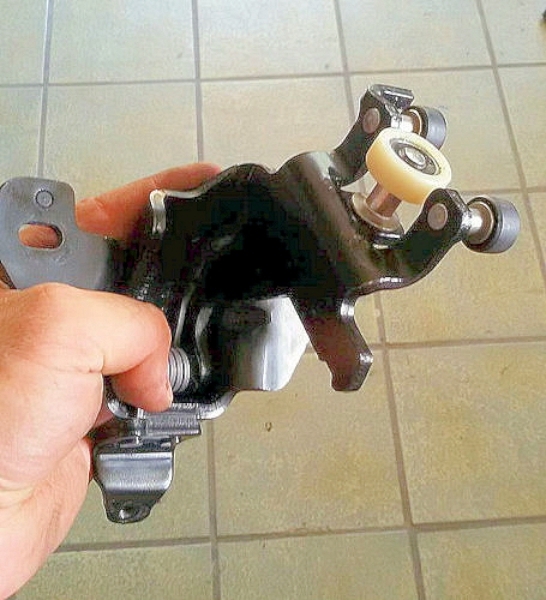 Worth repeating - clean off any surplus oil and dirt from the GUIDE RAILS as any oil or grease will attract dust and probably attack the guide wheels and the paint on the GUIDE RAILS. 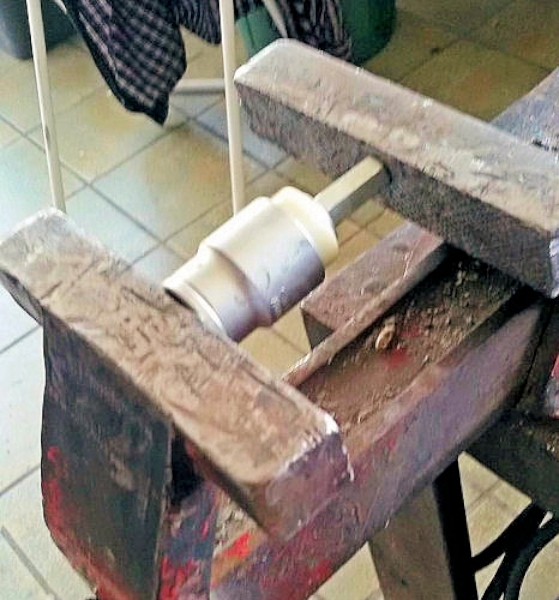 this was a ROLLER that ran in the lower GUIDE RAIL (not mine!). Possibly the bearing had seized as this ROLLER is very low down and may have got wet over the years. 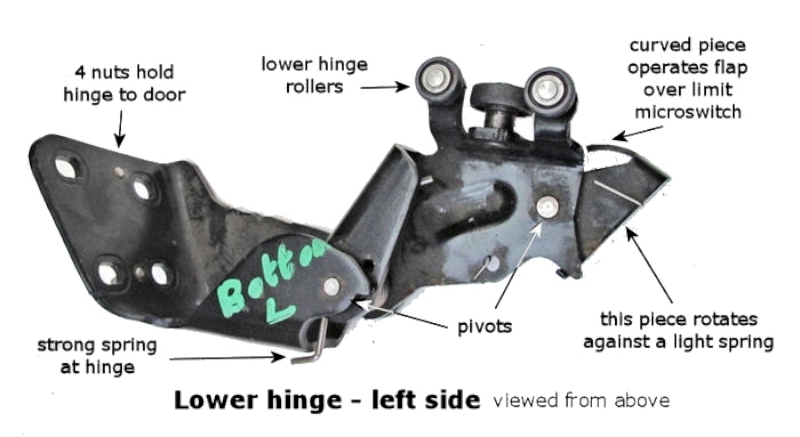 At the moment, (2015) complete new middle hinge assemblies, part numbers 9033S8 (left) and 9033S7 (right) are available from Peugeot for about £78 including VAT each. 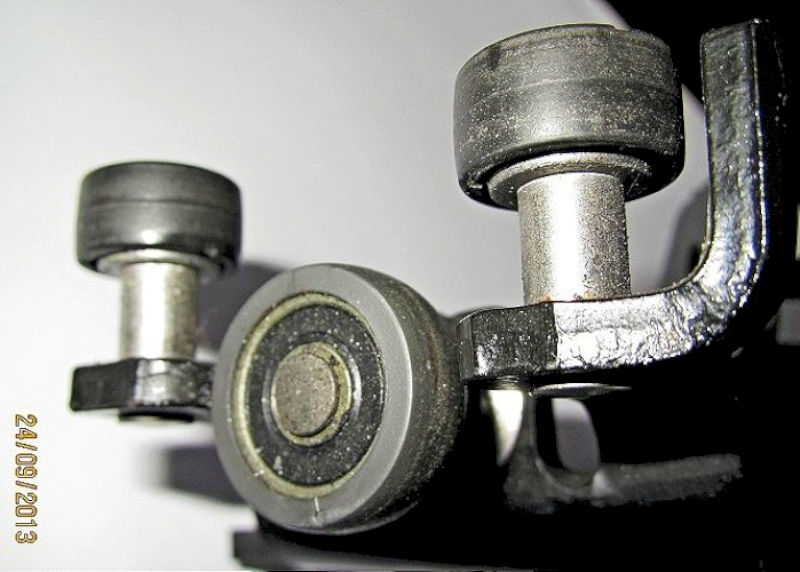 both middle door ROLLERS on the green car (50,000 miles) had split their nylon/rubber running surfaces (probably due to me oiling the bearings two years earlier). 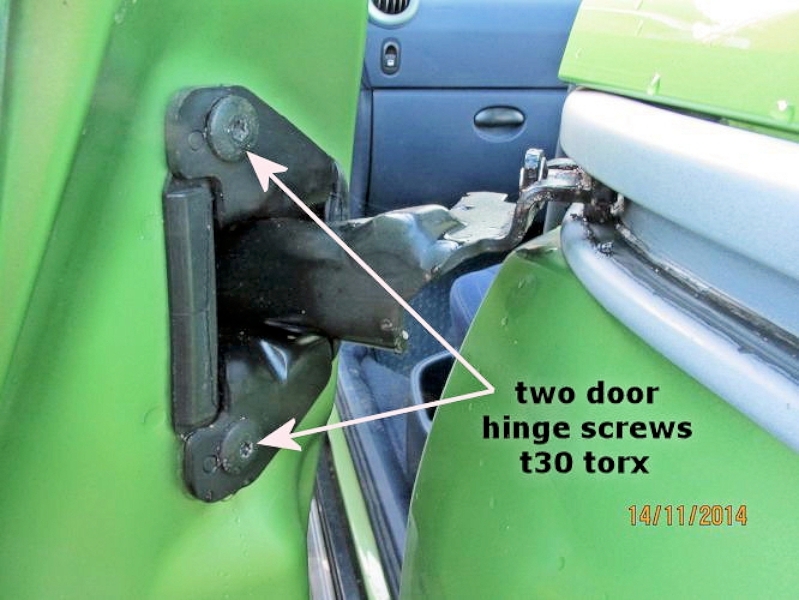 The original ROLLER assemblies had a third bolt under the inner door cover so the door covers had to come off as well but the job was fairly straightforward taking about 2½ hours for both. 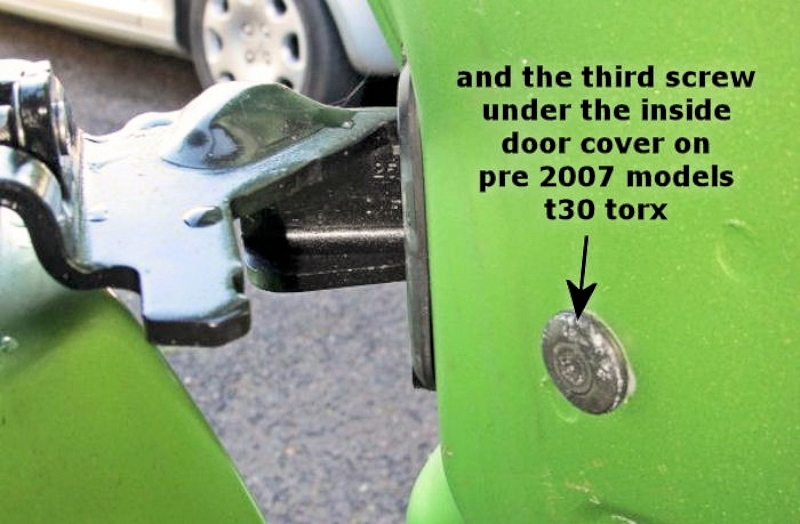 This is the third T30 bolt (2005/6 models only) which means the door cover has to come off to remove. after removing the three bolts (two on later cars) the hinge pulled out against spring pressure and was easy to slide off the GUIDE RAIL. This ROLLER had stopped rotating and just slid - only realised when I took it off that it wasn't a seized bearing but a split running surface. 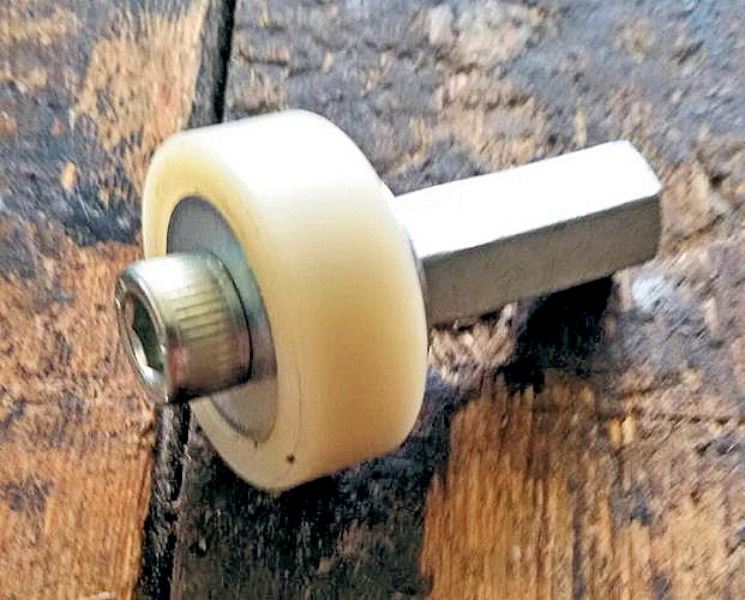 I found that a roller from one of the Ford Transits fits so it would be possible to replace just the one roller - to save costs and to future-proof the unique part. 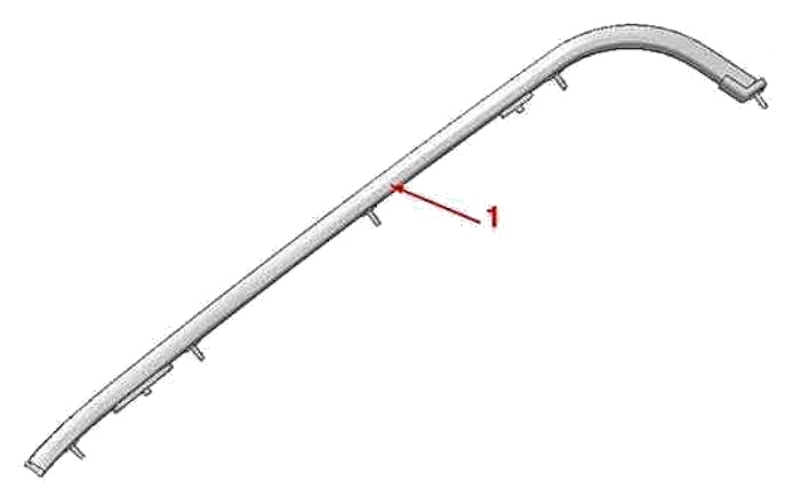 However - be aware that the steel of the pivot is very hard so this is not the best way forward. The trick is to push the tread off a new roller - they are quite tough. A little gentle heat will help. 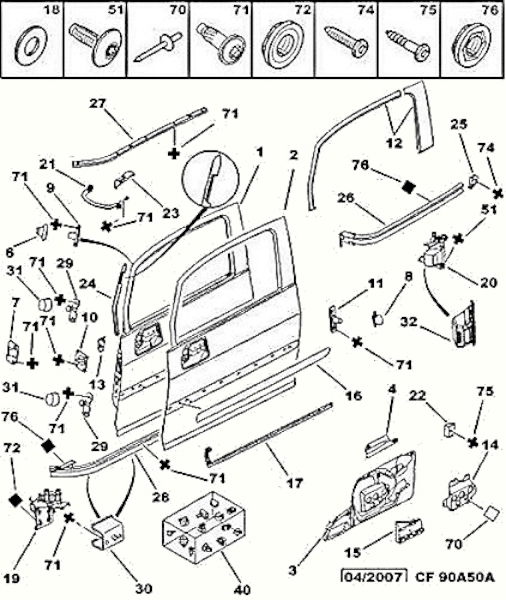 Paulo did it this way - you’ll need a socket spanner (22mm), a vice and some strong washers. 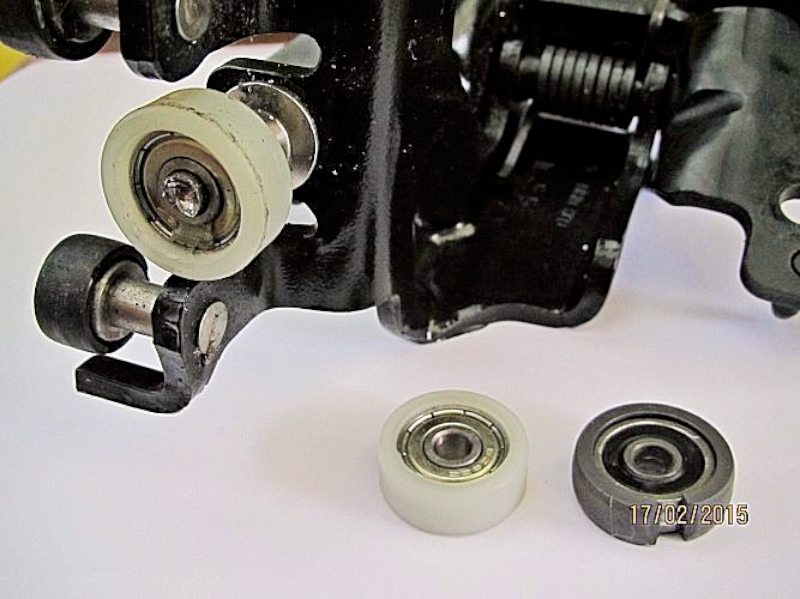 Build an assembly like this: The washers have to be of the correct diameter - that is the same diameter as the bearing but smaller than the nylon tread - so they press on the outer ring of the bearing, not the tread. Put the assembly in the vice and press off the tread. Turn the socket around and use it to press the new tread onto the bearing. Secure with some Loctite. - and you should end up with one like this! I did one myself - using a 12mm socket which just fits inside and presses on the bearing and a 19mm socket to press on the tread itself. The tread pressed off easily enough in the vice. 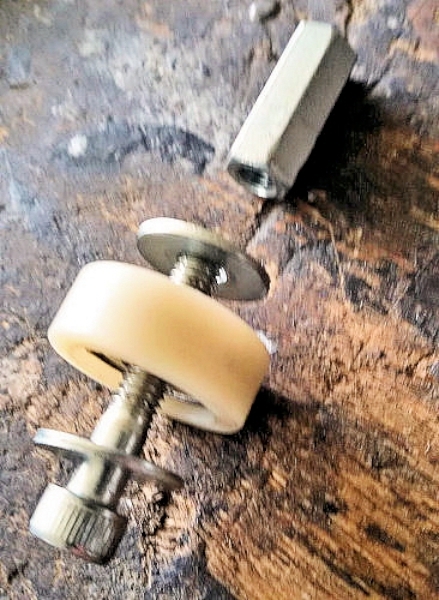 To get the tread onto the original bearing I had to open up the inside slightly and chamfer the leading edge - the material is quite tough and I found the best way was on the lathe. After doing this I pushed the tread on (using the 19mm socket the other way around) in the vice with a little force - I didn't glue mine as it seemed quite tight enough. Fitted September 2017 as the "new" Peugeot one had already started to split. Initial impression is that the white tyre makes no more noise than a new Peugeot one. However it has become increasingly noisy so in June 2018 was replaced by a new hinge assembly (see above). 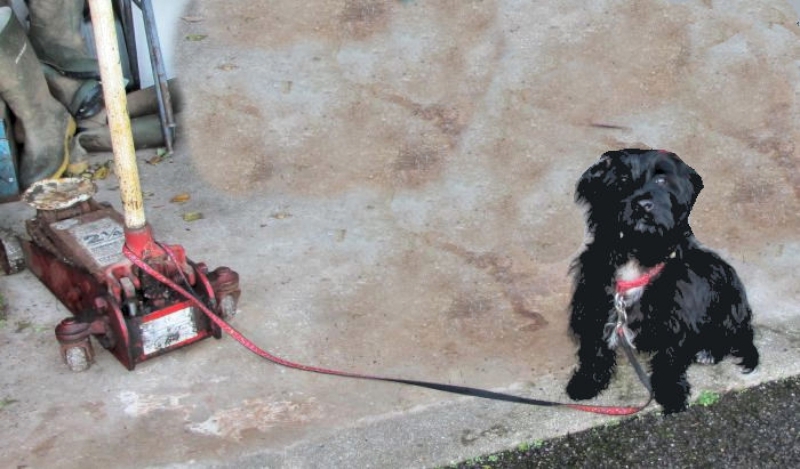 On inspection, the new roller surface had become slightly "lumpy" and with the harder material was making excessive noise. From what I can see on the drawings; the nuts holding the rail have to be taken off from the inside (which means removing the interior trim). 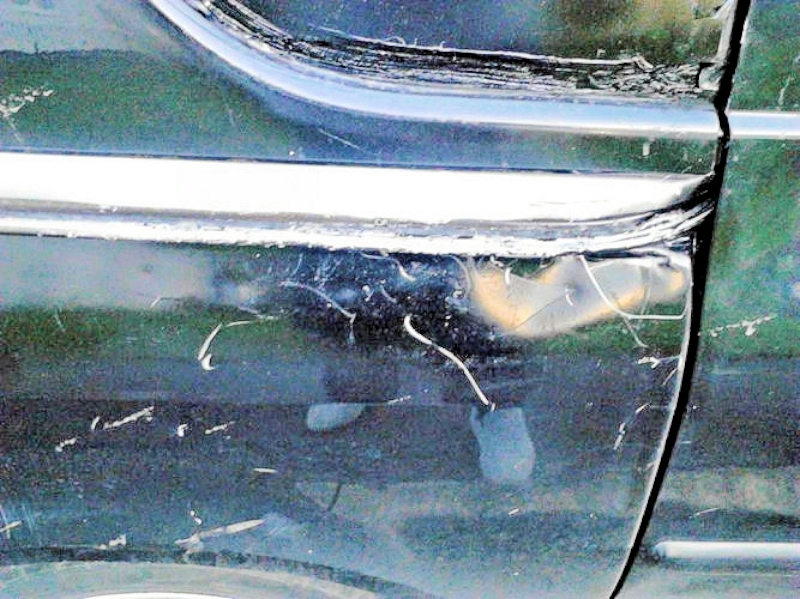 This is a really nasty dent; body repair will probably mean welding in another section and replacing the guide rail. Remove the centre rollers first and support the door partially open. The guide rail is held in place by studs on the back of the guide - which means it has to come off by pulling outwards. Note: this picture shows the inside of the left-hand body. To remove the guide rail it is necessary to take out the internal trim and speaker to get to the five M6 securing nuts. 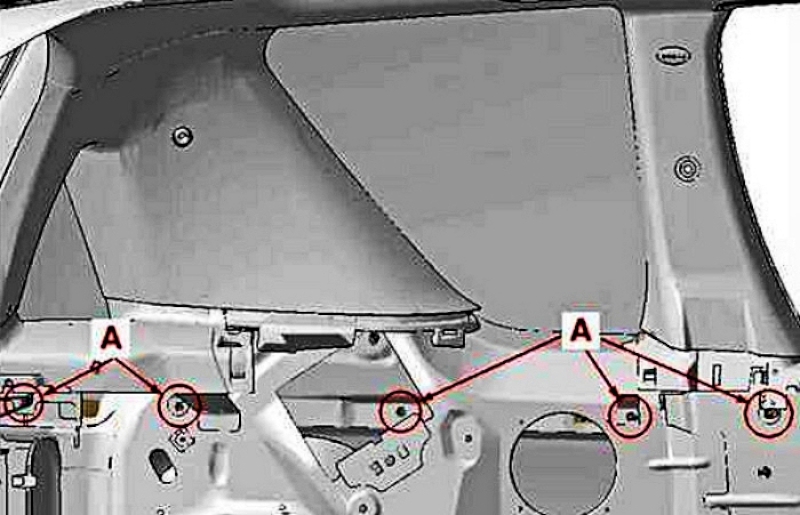 The nut holding the seat belt unit might also need to come out as it in the way. NEVER open the side with the spring (bulged) to loosen it when reinstalling (otherwise you could end up buying a new seat belt!) but open the opposite side and push open a locking mechanism then the belt slackens easily. 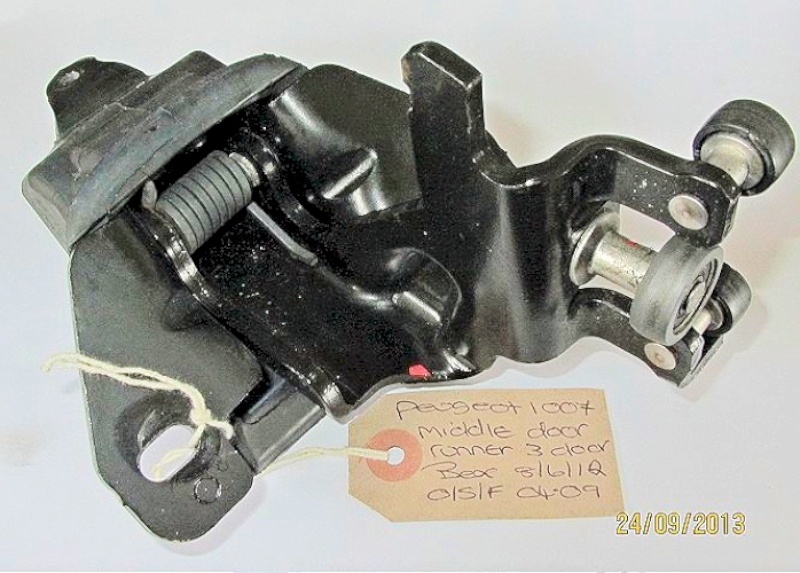 At the moment, (2015) complete new lower hinge assemblies, part numbers 9033Q3 (left) and 9033Q2 (right) are available from Peugeot for about £90 + VAT each. Isolate the battery and move the door to the centre. 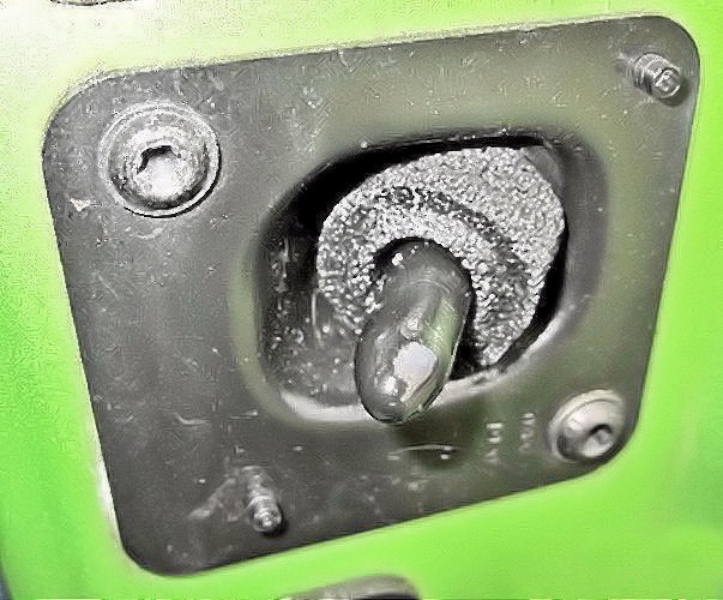 Undo the four nuts to release the door from the hinge assembly and slide the door all the way back and take the weight of the door with a jack or wooden chock. 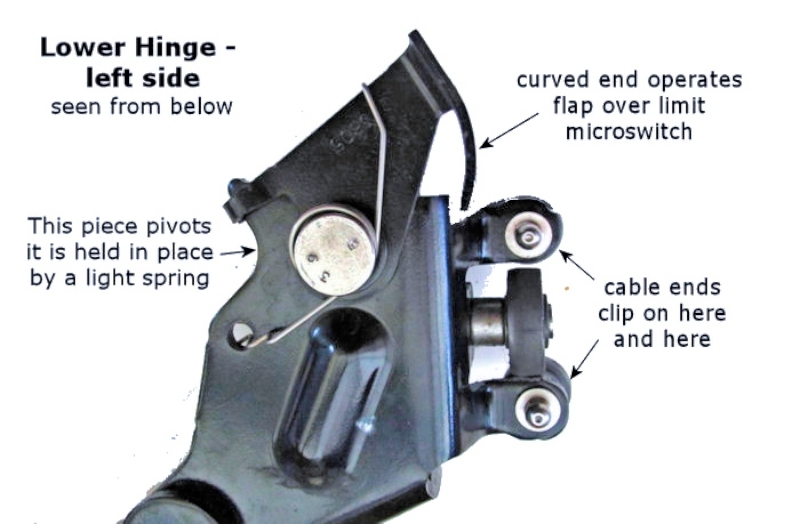 The hinge can be removed/replaced on the GUIDE RAIL easily by turning the whole hinge assembly sideways. Pop the cable connections off the balls one at at time and pop them back on the new hinges. Takes a little force to overcome a spring and pull the second connection on but doing them one at a time avoids messing up the positioning of the cables. 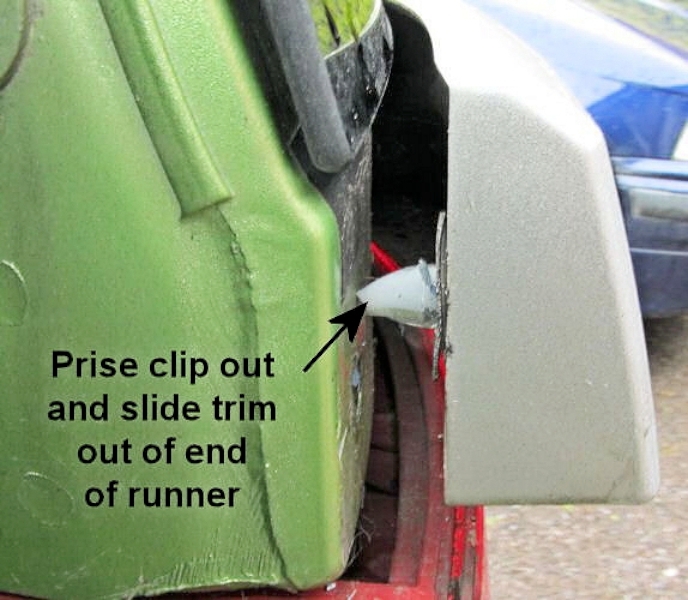 Reconnect the hinge assembly to the door and check all runs smoothly. When closed, the door is located by three spigots which locate into sockets. The one above and this one at the front of the door are fitted with a soft spongy washer to take up any slack and minimise rattles. The third spigot (not shown) is at the front of the door about eye level and fits into the matching slot on the A post. 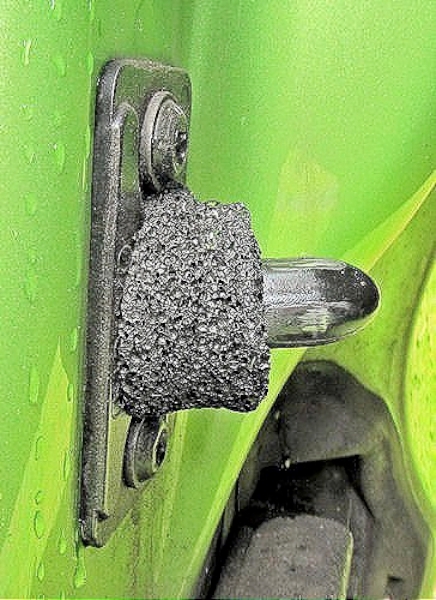 Do the doors rattle on poor roads? 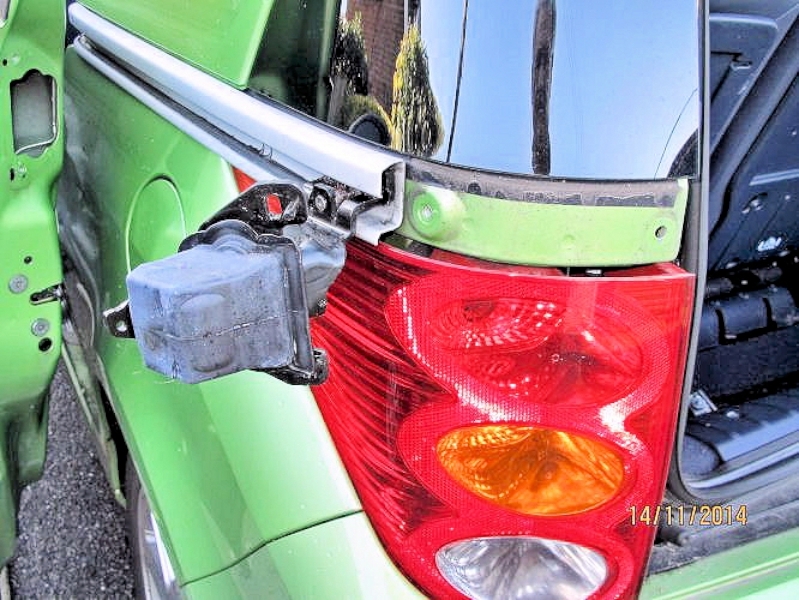 When closed the back of the door should be flush with the rear wing however this can be tightened a little by adjusting the position of the B-post actuator. 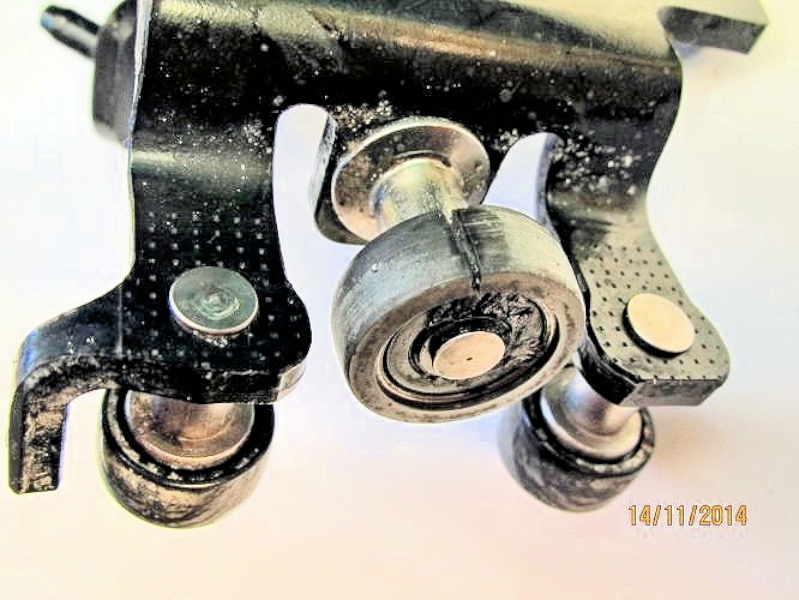 Above all, check the large rollers in the middle and lower guides still have the treads on them and are rolling freely - at this age some treads are deforming and even falling off. If the treads are damaged or missing then the door is left loose to rattle. 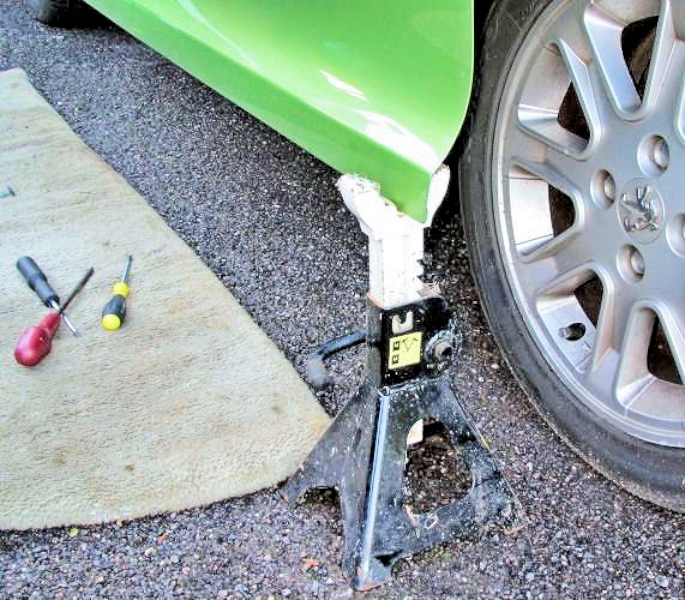 If the car has had ANY damage to the door or the sill, this will mess up the door alignment as it is critical for everything to be spot-on.